Look, we all kinda, sorta know that Apple will finally admit it's springtime tomorrow and let the white iPhone 4 fly the nest. 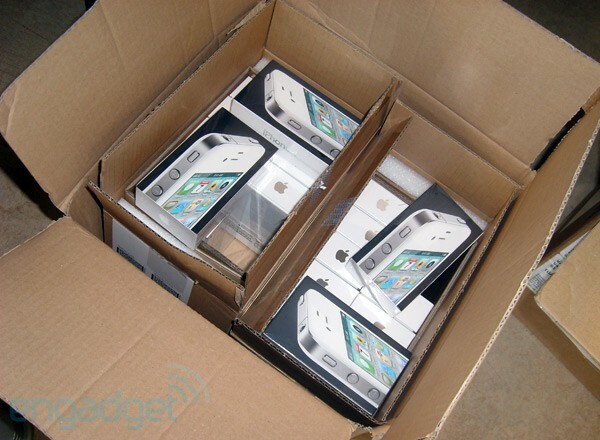 But in order to sell white iPhone 4s, you've got to ship them first, and one small Belgian retailer has just received its first batch of the mythical pale device and lined them up for some loving photography. Not only that, but they're even offering to sell you either the 16GB or 32GB over on their site (which, mind you, we can't vouch for! ), though they can only ship within the Benelux region. One more pic after the break.